Government of India approved the National Nutrition Mission to ensure holistic development and adequate nutrition for pregnant women, mothers and children. The mission is a concerted effort of the Ministry of Women and Child Development, Ministry of Health, Family Welfare and Ministry of Drinking Water & Sanitation & other key stakeholders. 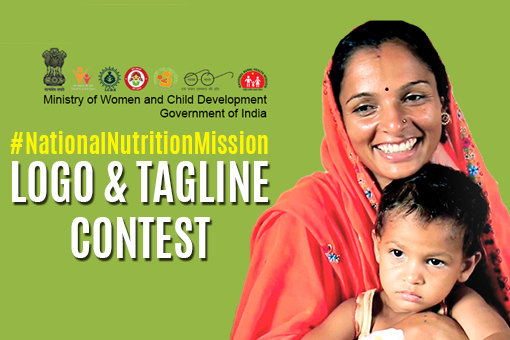 The National Nutrition Mission is the biggest effort to combat malnutrition in India. The Ministry of Women and Child Development invites creative minds to Design an appropriate Logo with a Tagline for the Mission. Last date of submission is 17th December, 2017 at midnight. The winner will be awarded a cash prize of Rs. 1,00,000. 1. Participants should upload the Logo in PNG format only. 2. The Logo should be designed on a digital platform. The winner of the competition shall be required to submit the design in an editable and open file format. Participants should not imprint or watermark Logo design. 3. Logo should be designed in colour. The size of the logo may vary from 4 cms x 4 cms to 60 cms x 60 cms in either portrait or landscape orientation. 4. The Logo should be usable on the website/social media such as Twitter/Facebook and on printed materials such as b/w press releases, stationery, signages etc. 5. The Logo should be in high resolution with minimum 300 DPI.